A couple of weeks ago I made some cakes to take down to the Leeds office when I went for the day. Given it was December I decided that I should make something Christmassy. I hadn’t been food shopping so I was limited with what flavour I could make so just went with vanilla. 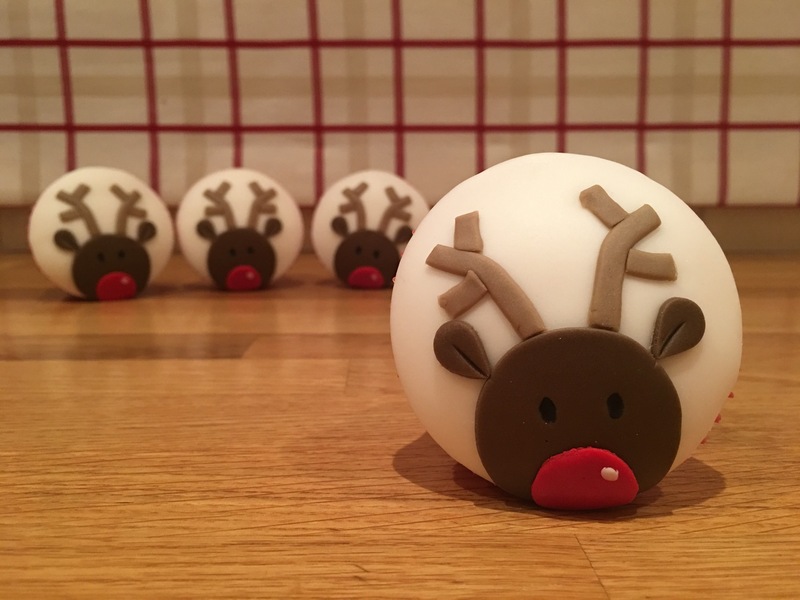 The decoration was an easy choice – I made these cakes last year and really wanted to put them on the blog but never got round to taking photos. They are fairly simple to make, just a bit time consuming due to the fact you have to cut out a lot of shapes. To cover them in white icing I first piped a small swirl of buttercream on top of each cupcake. I let it dry out slightly (not too much) and then pressed it down with the palm of my hand to create a smooth dome. I cut out a white circle of icing, slightly bigger than the top of the cake, to go on each. I tried to roll it fairly thin – you want it thin enough that you taste more than just sugar, but not so thin that you see any lumps and bumps in the buttercream through it. I brushed a small amount of water onto the buttercream and then smoothed the circle of white icing on top of it. 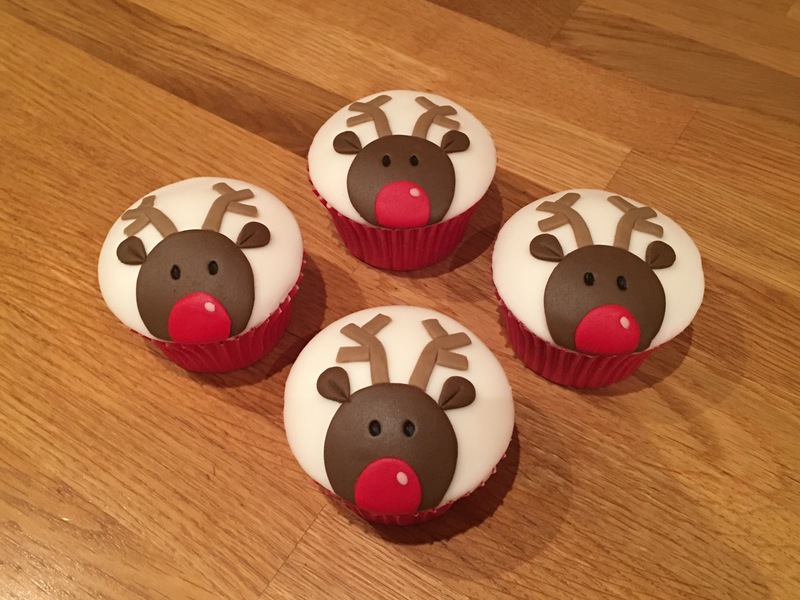 The reindeer heads were made from dark brown icing (you can roll this as thin as you can get it) – I cut out a circle and then used the same cutter I used for the white icing to cut the bottom off so that it fitted to the edge of the cake. The red nose was done in the same way but with a smaller circle cutter. The ears were cut out of brown icing using a tiny petal cutter and pushed a knife down the middle of them when I stuck them to the cake to create a line. The antlers were made from strips of pale brown icing. 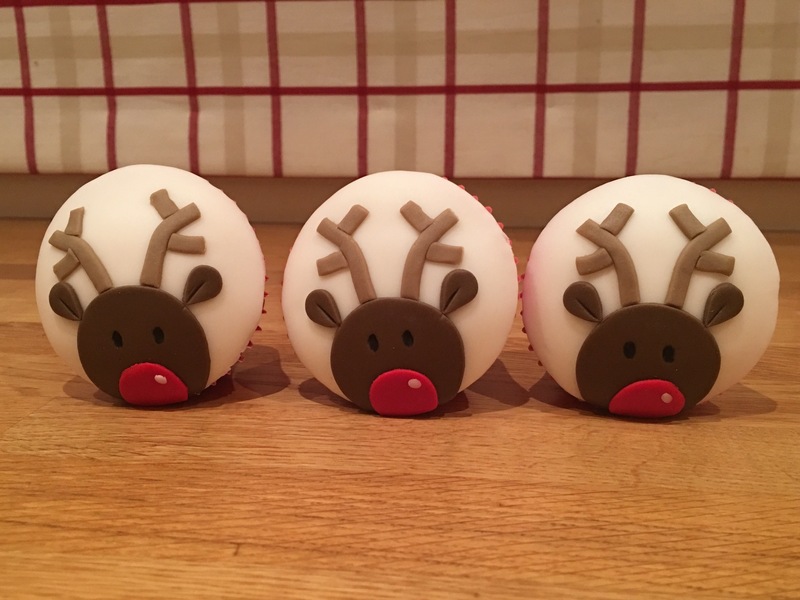 Finally I pressed a small dot of white icing onto the nose and drew the eyes on with a black edible pen.